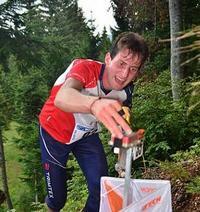 I've practised orienteering since I was little child. During all this time, it has been the most beatiful sport which I've loved to do. It gave me sense for beauty of free movement in the nature, it gave me some first success and helped me to find selfconfidence after vexation at maternity school. It helped me to make my first money, gave me my love and many other unforgettable experiences. And I hope it will still continue like this! Other results are not so imortant or I forget them :-) All my other results could be found by links at page Orienteering results.